Want to fill GPSC Recruitment 2019 Form? If yes then you are able to fill application form from here. Gujarat Public Service Commission is well known as GPSC which is inviting the candidates to apply online for 1162 AE, Assistant Professor & Other Jobs. Interested candidates can fill online form GPSC AE Recruitment 2019 through the direct link as given below. Starting date of the online registration process is 18.03.2019 for AE & Other Posts. The Last Date of submitting the completely filled application form will be 18.04.2019. The Department will be selecting the eligible candidates on the basis of Written Examination & Interview for GPSC Vacancy 2019. Candidates can collect the more important details related to Gujarat PSC Jobs 2019 from the mentioned article below. How I Check Eligibility Criteria For GPSC Recruitment 2017 ? AM I Eligible to Fill GPSC Medical Officer Jobs Online Form ? How Much salary will Paid For GPSC Assistant Engineer Recruitment 2017 & Gujarat PSC Jobs ? What is the Application Fee Required for Applying GPSC Jobs Online Form ? Education Qualifications For GPSC AE Recruitment 2019 Candidates must hold the Degree or Diploma in the recognized University/ Institution. How To Fill Online Forms For GPSC Recruitment 2019? 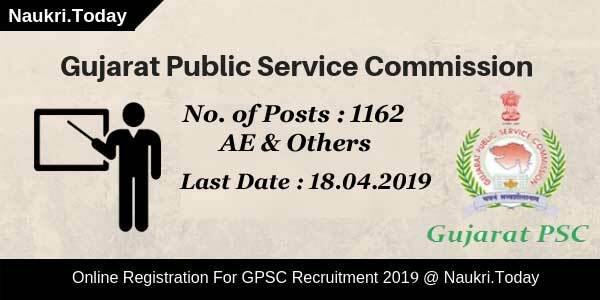 Search for GPSC AE Recruitment 2019 Notification Pdf. Click on it. Study the GPSC Jobs 2019 Advertisement. Then recheck the all the information available in the from. Go to the payment window. Conclusion: GPSC Recruitment 2019 notification is uploaded on its official website for 1162 AE, Assistant Professor & Other Jobs. Applicants can apply for GPSC AE Jobs before the last date which is 18.04.2019. Dear Applicants, Are you waiting for GPSC Recruitment 2019? If yes then here is great opportunity for you. Gujarat Public Service Commission has issued notification for 275 Assistant Professor posts. Interested and eligible candidates can apply through online mode. Opening date for filling application form is 15.12.2018 at 1:00 PM. Participants must apply online for Gujarat PSC Assistant Professor Jobs 2019 before or on 31.12.2018 till 1:00 PM. For more information regarding Selection process, eligibility criteria & age limit, participants must read the given article carefully. Fresh Update as on 31.12.2018: Applicants who are looking for Assistant Professor jobs must apply online for GPSC Recruitment. Today is the last date for filling application form. So, hurry up Candidate should not delay in registration for GPSC AP Jobs. resh Update as on 28.12.2018: Hello Friends, Do you want to apply for Assistant Professor Jobs? If yes then participants can apply for GPSC Recruitment. Candidate can get more information regarding GPSC Jobs selection process, eligibility criteria from here. Last date to fill application form for assistant professor post is 31.12.2018. Fresh Update as on 24.12.2018: Participants who are searching for Assistant Professor Jobs can apply for GPSC Recruitment. Before filling application form candidate must check eligibility criteria, selection process here. Last date for submission of online registration form is 31.12.2018. Participants who wish to apply for GPSC Recruitment 2019 must fulfill some eligibilities. Some eligibility parameters are fixed by the department which are mention in the below section. Contenders must fill Gujarat PSC Vacancy 2019 application form very carefully otherwise their forms may get rejected. Applicants who are filling online application form can check education qualification required for GPSC Vacancy 2019 here. Participants must have Degree of Post Graduation with minimum marks 55% from any recognized University. Additionally, candidate should have Master Degree in relevant subject for which they are applying. For more details regarding education qualification contenders may go through GPSC Notification 2019 from the direct link given below. Aspirants must have minimum age as 21 years for GPSC Recruitment 2019. Maximum age of the candidate should not be exceeding to 40 years. For reserved category participants upper age relaxation scheme is applicable as per government rules and regulation. To get more information regarding age limit candidate can check official notification of Gujarat PSC Recruitment 2019. Department will take written examination for the candidates who have filled online application forms for GPSC Vacancy 2019. Participants who qualify in preliminary written test, they will get called for interview session by the department for Gujarat PSC Vacancy 2019. Selection of the aspirants will be on the basis of marks obtained in preliminary test and performance and behavior during interview session. 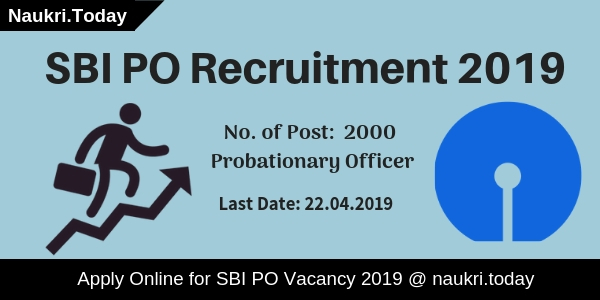 To get rest of details applicants can check GPSC Recruitment 2019 notification either from official portal or through link given below at the end of the article. Applicants who are going to fill online registration form for Gujarat PSC Vacancy 2019 have to pay application fee. Candidates belonging to Unreserved Category/ General/ OBC need to pay Rs.100/- as registration fee for Gujarat PSC Jobs 2019. Participants who belongs to Reserved Category/SC/ST/Ex-Servicemen are exempted from the payment examination fee. Payment of application fee of GPSC Recruitment 2019 should be done through Debit Card, Credit Card & Net Banking. Department will pay great salary package to the candidates who get selected for GPSC Vacancy 2019. Pay scale for Gujarat PSC Assistant Professor Jobs 2019 is Rs.15900/- to Rs.39100/- with grade pay of Rs.6000/-. For more details regarding pay band applicant may check GPSC Notification 2019 from link given below. Those applicants who are going to fill application forms must apply online for GPSC Assistant Professor Vacancy 2019 till 31.12.2018. Here we are providing you some instructions to follow while filling online registration form. At first, aspirant must log on to official portal i.e. gpsc.gujarat.gov.in. Then go to homepage & click on “Recruitment” option. 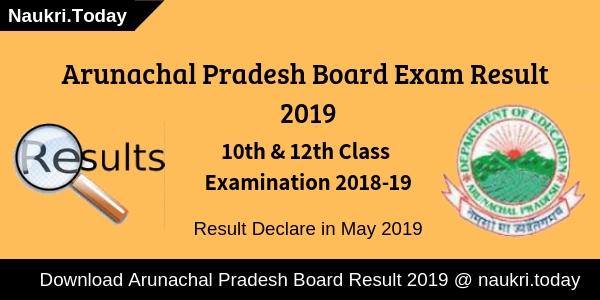 Search for GPSC Notification 2019 & click on it. Fill all the required entries in registration form. Upload your recent passport size photo & scanned signature in form. Recheck all the details given by you in GPSC Recruitment form. Make payment of application fee by online mode. Applicants can also take print out of application form for future use. Conclusion: Gujarat Public Service Commission is inviting application for 275 Assistant Professor post. Applicants who are eligible can fill online forms for GPSC Recruitment 2019. Last date for submission of online registration forms is 31.12.2018 till 1:00 PM. Examination dates will be announced soon by the department. If you are searching GPSC Recruitment Notification 2018 for 765 various vacancies then here is relevant information for you. Gujarat Public Service Commission has released the notification for filling up 765 Asst., Engineer, STI & other Vacancy. Those applicants are interested and eligible for Assistant Engineer & other vacancies may apply through online mode. The GPSC Vacancy Online Form is available from 15th October 2018. Applicants can submit their online form till the last date 30.10.2018. So must read the full article properly and then click on the link Apply online for GPSC Jobs 2018. Gujarat PSC is inviting online application form for recruitment of Asst. Engineer, Asst. Professor & STI Vacancy. Applicants those are interested and eligible also for GPSC STI Bharti can fill the online form at naukri.today. the online application form is already available here and the official site also. So don’t waste your time and submit Gujarat PSC Recruitment Online form till the last date. Details regarding eligibility criteria, application fees, selection procedure and how to apply for Gujarat PSC Assistant Engineer Job is available on below section. Fresh Update as on 19.10.2018: Gujarat Public Service Commission Online form for AE, Asstant Professor & other vacancy is available till 30.10.2018. Those applicants are interested and eligible to apply online for GPSC Recruitment may fill their online form till the last date 30.10.2018. Applicants who want to apply for Gujarat PSC Recruitment must fulfill eligibility criteria also. The details of eligibility like education qualification, age limit and other parameters are mention below. Applicant must ensure that they are eligible or not GPSC Vacancy 2018. The details are as under. Assistant Engineer: For Gujarat PSC Assistant Engineer Vacancy applicant should have Engineering (Civil) or Technology (Civil) from the recognized university. State Tax Inspector: Applicants those are going to apply for GPSC STI Recruitment must have Graduation Degree from a recognized university. Candidates also have basic knowledge of computer. For more information check GPSC Recruitment Notification which is mention at the end of the article. Assistant Professor: If you are going to apply for GPSC Assistant Professor Job then you must complete your Post Graduation with 55% marks in the relevant subject. Furthermore, details check below Gujarat PSC Vacancy Advertisement. Assistant Research Officer: If you are going to fill GPSC Online Form for Assistant Research Officer then you must have Master Degree in Engineering or Technology. Rest information download official GPSC Bharti Advertisement. Age of applicant will calculate on the last date of receipt application form i.e 30.10.2018. The age criteria of GPSC Vacancy is made according to post. In below section, we mention post wise upper age criteria of GPSC Assistant Professor Recruitment 2018. Assistant Engineer & STI Post: Applicant should be between from 20 years to 35 years for GPSC Jobs 2018. Assistant Professor & Assistant Research Officer: The maximum age is required 40 years. Upper age relaxation is applicable for all vacancies as per category wise. Applicant selection for GPSC Recruitment 2018 will be done on the basis of written examination and personal interview. Applicant must qualify both rounds to select for above posts. Candidates who want to apply for GPSC STI Recruitment and other posts and fulfill eligibility criteria also may apply through online mode. If you are going to fill GPSC Job Online Form then you must have valid email id and mobile no. The last date of online registration is 30.10.2018. Now follow some instructions to fill up the application form. First of all, go to the official site gpsc.gujarat.gov.in. Click on the link apply online for GPSC Vacancy for various posts. Now click on the post which you want to apply. Enter all require details such as personal and educational. Upload required document on GPSC Recruitment Online Form. Submit the GPSC Assistant Professor Job application form carefully. Conclusion: Gujarat Public Service Commission has released an advertisement for 765 various posts. Those applicants interested and eligible for GPSC Recruitment 2018 may apply through online mode. The Gujarat PSC Job Online Form is available from 15.10.2018 to 30.10.2018. Are you a Civil Engineer? Want to apply for Gujarat PSC Department? If yes, then you must have heard regarding the GPSC Recruitment Notification 2018. You can make use of this article to read the complete information about the GPSC Vacancy. Participants who are interested to apply for the GPSC Assistant Engineer Jobs 2018 can apply for total of 149 posts. The application mode for the Gujarat PSC AE Vacancy is completely online based as per the advertisement. The interested applicants can submit their completely filled application form latest by 31st July 2018. Gujarat Public Service Commission is now inviting online application form for total 149 Assistant Engineer position. Candidates who are eligible and interested as well can fill the online application form for the vacant post from here at naukri.today. The applicants can submit the application form for GPSC Recruitment 2018 now, as the registration process is successfully going on. You will get the direct Official links to apply online for the Gujarat PSC Jobs 2018 in the end of the article. Candidates can also check the steps given here to download the GPSC Assistant Engineer Vacancy Advertisement pdf. Tentative Preliminary Exam Date: 30.12.2018. Gujarat Public Service Commission has released an advertisement for total 149 vacant posts of Assistant Engineer who is holding Engineer Degree in Civil Branch. General Category: 113 Posts out of which 37 are reserved for women applicants. Scheduled Tribe: 36 Posts and out of that 11 posts are reserved for women. Applicant must possess Engineering Degree in the Civil Branch from a recognized institution incorporated by the Central or State Act in India; or any other recognized institutions. The candidate must also have basic knowledge of Computer Application as prescribed in the Gujarat Civil Services Classification and Recruitment (General) Rules, 1967. To apply for Gujarat PSC AE Recruitment Participants must have proper knowledge of both the languages i.e. Hindi as well as Gujarati. The contender who wishes to apply for the GPSC Jobs 2018 can check the required age limit given here. The candidate must be of minimum 21 years and maximum 35 years as on 30.07.2018. Age relaxation for Gujarat PSC Assistant Engineer Recruitment will be given to the participants who belong to the category mentioned below. Candidates who are going to apply for the Gujarat PSC Assistant Engineer Vacancy need to pay some amount as application fee. Applicants need to pay Rs. 100/- as application fee. You refer to the official website for more details regarding the payment mode of an application fee for the GPSC AE Jobs. Participants who will qualify both the phases of selection will now work for the department on Assistant Engineer Post. The department will pay a good amount of salary to the selected applicants for Gujarat PSC Assistant Engineer Recruitment. The will get Rs. 9300/- to Rs. 34800/- along with Grade Pay of Rs. 4600 ROP 2016 Pay Matrix Level 8 Rs. 44900 – 142400. Third step is to click on “Adv.No. 38/2018-19”. Now, GPSC Vacancy 2018 Notification will open. Fill all the details required to fill the online form. Conclusion: GPSC Recruitment 2018 notification is now published on its official website. Participants who are interested can fill the online application form for Gujarat PSC Assistant Engineer Jobs latest by 30th July 2018. The applicants will get the complete details regarding the GPSC AE Vacancy 2018 – 19 from our website i.e. naukri.today. You can visit our website regularly for the latest updates. Are you searching for Gujarat PSC Jobs Notification 2017 ?? ?, then in this article you can get full information about GPSC Recruitment 2017 for 2481 Various Jobs. Recently. PSC Department Gujarat has published a recruitment notification of 2481 Medical Officer, AE, Police Inspector & Other Post. Applicants who are interested in Gujarat PSC Recruitment 2017 can fill online form here. You can apply online form for GPSC MO Vacancy on or before the closing date, that is 02.08.2017. Gujarat Public Service Commission is also known as GPSC. Department is inviting application form through online mode for filling up 2481 Medical Officer, AE & Other Various Posts. Applicants who are waiting for Govt. Jobs in Gujarat State this is very good job opportunity for them. Submission of Online form for GPSC Vacancy has been started. Remaining information like Eligibility Criteria & Division of Gujarat PSC Jobs you can check from below article. Minimum age of the candidates for GPSC Recruitment 2017 should be 18 years. For AE, Inspector & Executive Engineer Jobs minimum age must be 20 years. Candidates can check post wise upper age limit for GPSC MO Jobs is shown below. relaxation in age for 2481 various jobs is applicable up to 05 years for SC/ST Category candidates of Gujarat state. For Post No. 01 : Upper age of the candidates should be 40 years for Social welfare officer Jobs. For Post No. 03 : For this post maximum age should be 40 years. Remaining Post : Maximum age of the candidates should be 35 years for GPSC Vacancy. Applicants can check post wise monthly Salary/ Pay band for Gujarat PSC Recruitment 2017 which is shown in above table. If you want to get more information you can also read official GPSC Notification which is mention below. Social Welfare Officer Post : Post Graduate Degree with social work/ Post Graduate Diploma in rural management or equivalent qualification. Medical Officer Jobs : Candidates must have done bachelor’s Degree in Medicine or Surgery from any recognized University for GPSC MO Recruitment 2017. Principal : Post Graduate degree in Nursing with 15 years of work experience. Junior Assistant Electrical Inspector : Applicants must have done Degree in Electrical engineering or Electrical Technology from authorized Institute. Assistant Engineer (Civil) : Possesses bachelor’s degree in Civil Engineering from any recognized University for GPSC AE recruitment 2017. GPSC Recruitment For Police Inspector Jobs : Applicants must have done Bachelor’s Degree in any stream from authorized Institute. Gujarat engineering Service (Civil) : Bachelor’s Degree in Civil engineering or Technology from any recognized university is required for Gujarat PSC Jobs 2017. Candidates who are belonging from general category must paid Rs. 100/- as application fee for Gujarat PSC Recruitment 2017. Applicants of Reserved Category & PWD category of Gujarat State are exempted from paying application fees. Candidates will selected for GPSC Recruitment 2017 on the basis of Written Examination & Personal Interview. Candidates can check full information about Post wise Selection Method & Exam Procedure from official GPSC Jobs Notification, which is shown in official link. First of all candidates log on to the official website www.gpsc.gujarat.gov.in. Now click on official Gujarat PSC vacancy Notification link. Now click on Apply GPSC Jobs Online Form link. Make all the information in form carefully. Conclusion : GPSC Recruitment 2017 for 2481 MO. AE & Other Vacancy. Candidates can fill online form for GPSC AE recruitment 2017 on or before the closing date 02.08.2017.